With a busy week of being on the go, I finally got the chance to sew yesterday. Yea! 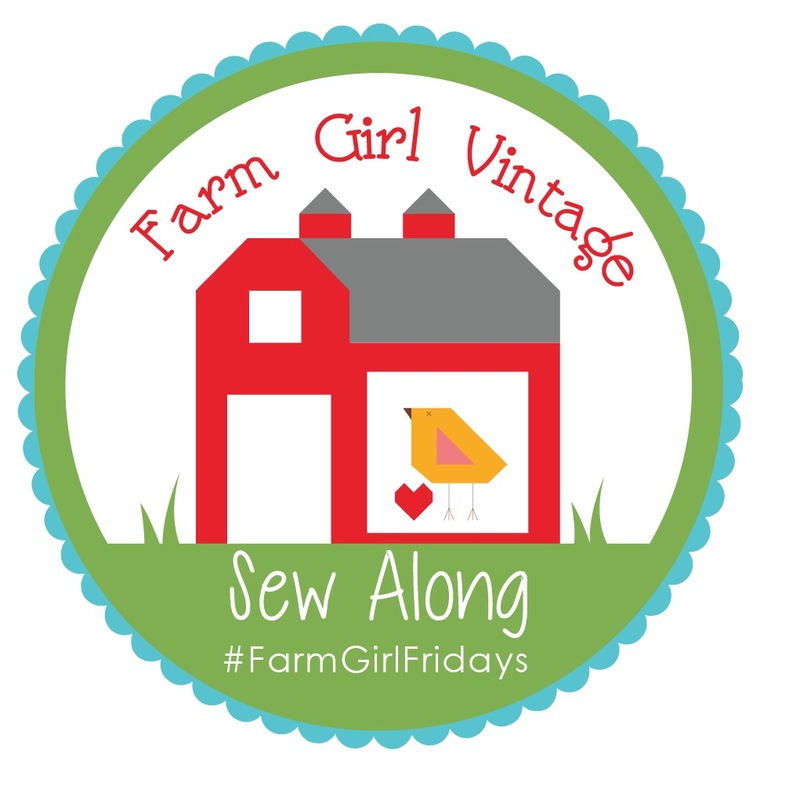 I was a week behind on the Farm Girl Vintage Sew Along and I hate getting behind. So happy to be all caught up again! I loved the extra little heart that Lori Holt of Bee In My Bonnet added to her churn dash block so I copied her. You can see her instructions here. I seem to either make blocks with pastel colors or blocks with primary colors. I hope they all blend together well in the end. I think I need more fabrics to mix it up. Shopping time!! 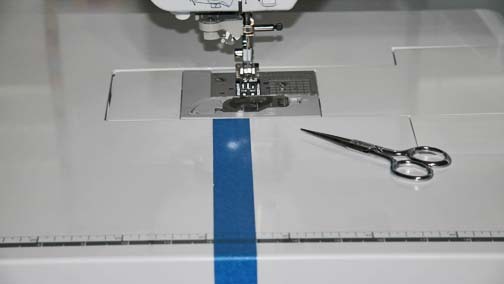 Someone asked me why I have blue tape on my sewing machine table. 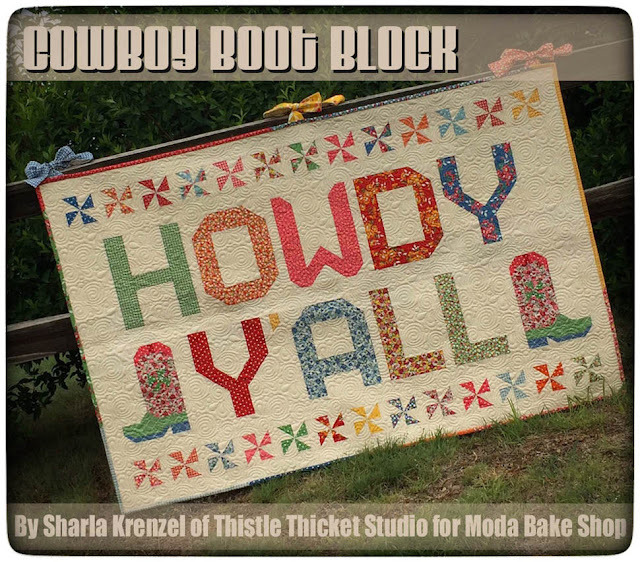 The truth is I'm lazy and I hate drawing all those diagonal lines on the backs of squares for half square triangles (there's a lot of HSTs in the Farm Girl Vintage Sew Along blocks). 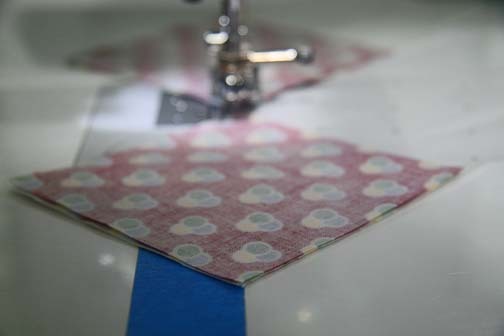 So, using a carpenter's square for accuracy, I placed a piece of painters tape down my sewing table that lines up perpendicular with my needle when it's in the center position. 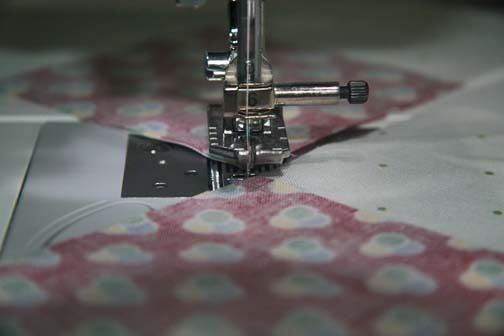 I use the edge of the tape to line up the points of my squares and enables me to sew a straight and accurate line diagonally across my half square triangles without drawing a line. It's so quick and easy! 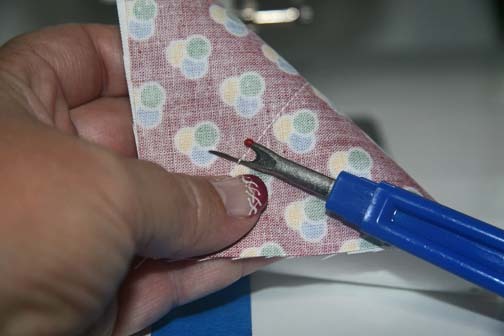 First, I line up the point of my squares with my needle. Well, except for when you put the wrong colors of squares together and then you have to rip! I really don't have to rip too often though, because Lori's instructions in her book "Farm Girl Vintage" are so clear and easy to follow. 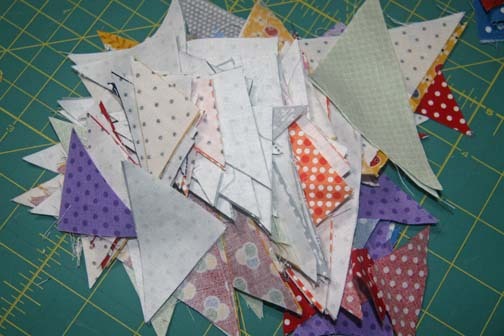 I'm starting to amass a pile of triangle remains from all of these half square triangles. They are anywhere from 1" to 3" in size. I'm thinking about making them into a mini project - am I nuts? How small is really too small? 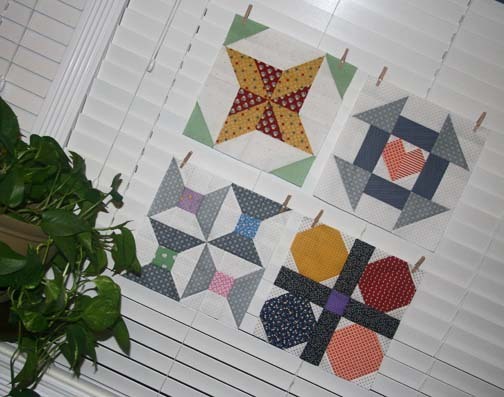 I would love to see other mini half square triangle projects. If you have one, please share in the comments! P.S. I spent a little time (well, really a lot of time) this week revamping my blog. 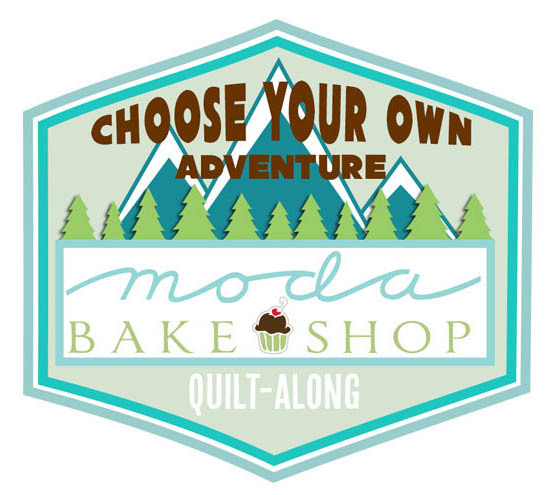 It's part of a new quilt blog group I'm participating in. I'll talk about it more in upcoming blogs. But I'm really happy with the new, cleaner look. 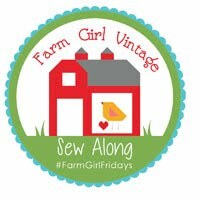 One of the things I learned from this group was how to make those little red heart social media links at the top right of the blog. Now we can be friends in all sorts of places! I also discovered Bloglovin' from this group. This is an awesome way to track the blogs you like and it will notify you when your favorite bloggers make a new post. 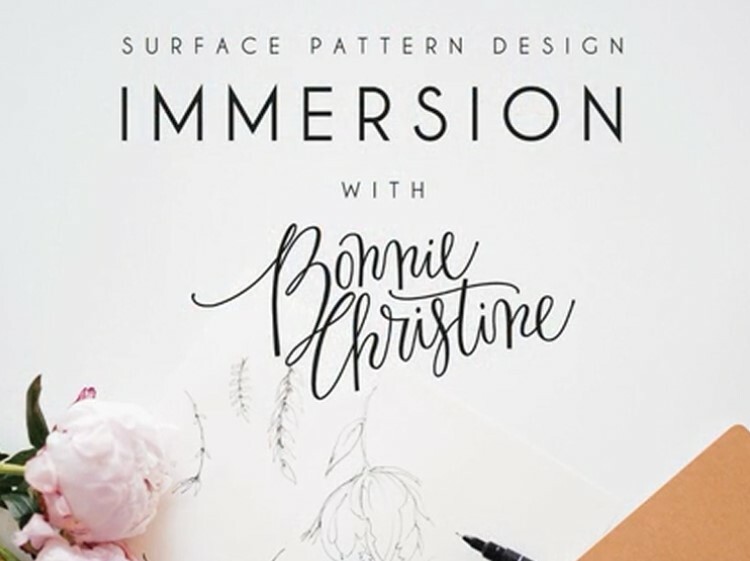 Hope you'll start following me on Bloglovin' (and Facebook, and Instagram, and Twitter, and Pinterest too)! I think your site looks very crisp, and I like your red heart social media buttons! Congratulations on getting caught up again, too. I use the tape method like you describe when the HST blocks are small enough that my points don't droop over the edge of my table. Otherwise, I go back to the make a line down the middle method. Thanks Yvonne! I'm so excited to figure out the social media buttons, I've been wanting to do that for a long time. Hi Sharla! Nice to meet you. 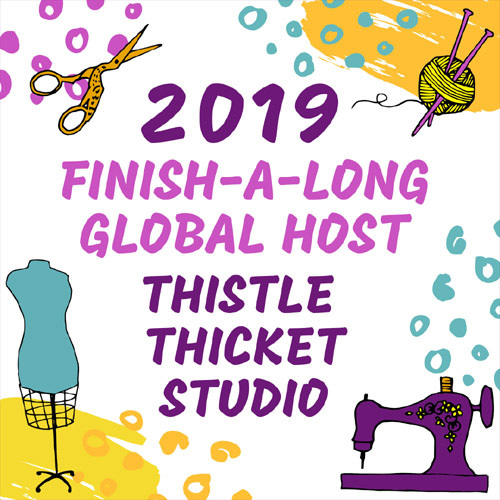 You will have so much fun in the new blogger hop. I was in it two years ago. And met many new friends. 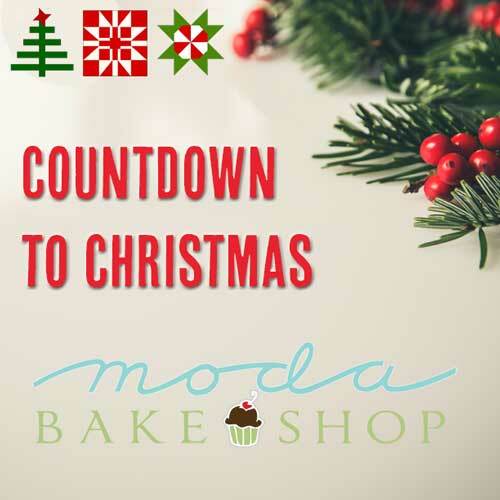 Hope you will too! Thanks Lorna! I'm really looking forward to the New Blogger Hop experience. 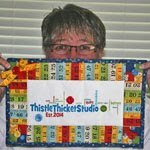 It's been great discovering all the new quilting blogs and getting to know everyone. 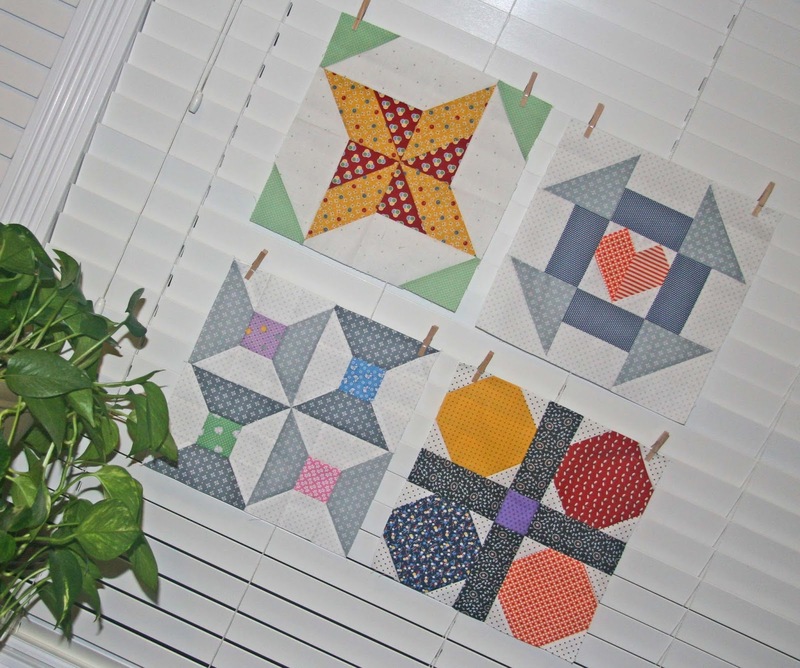 My Turn on the 2015 New Quilt Bloggers Blog Hop!